When this card is Special Summoned: You can target 1 opponent's face-up Attack Position monster; return it to the hand. When a Spell/Trap Card or another monster's effect is activated (Quick Effect): You can shuffle 1 face-up Pendulum Monster from your Extra Deck into the Deck, negate the activation, and if you do, destroy that card. 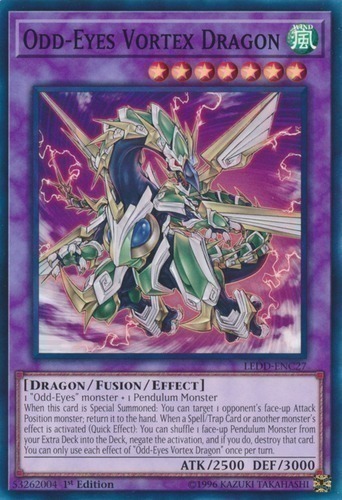 You can only use each effect of "Odd-Eyes Vortex Dragon" once per turn.